Background: Squamous cell carcinoma is the most frequent malignancy of the oral cavity. The survival rate of this malignancy has not improved from past two decades. The major factors responsible for this could be due to loco regional and distant metastatic spread. However, the other important prognostic factor is concomitant occurrence and recurrence of multiple primary carcinomas in the head and neck region, which is explained as the concept of field cancerization. The evidence to support the field change in normal mucosa of Oral squamous cell carcinoma (OSCC) through biological markers using immunohistochemistry has always been challenging. Aim: Hence, the aim of the present research is to identify changes in the expression of CK 8/18, 19, and MMP-9 to visualize field changes in the clinically normal mucosa adjacent to OSCC and compare with non neoplastic normal oral mucosa. Materials and Methods: 20 cases of OSCC with radical resection specimens were included in the study. Lesional tissue and adjacent normal looking mucosa were taken during grossing. Ten cases of non-neoplastic normal oral mucosa are also included in the study. 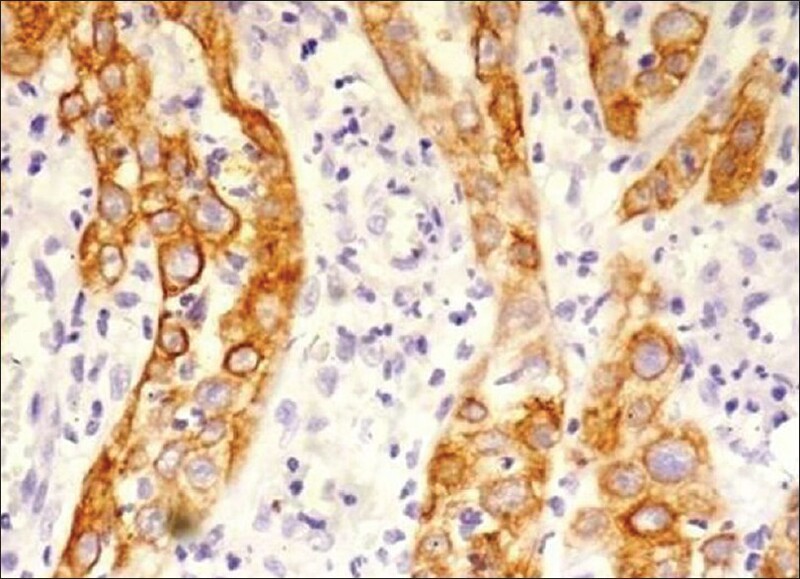 Markers such as CK 8/18, CK 19, and MMP-9 are used by the immunohistochemical method in this present study. Result and Conclusion: The enhance expression of CK 8/18 (80%), CK 19 (70%), and MMP 9 (90%) in ANM was noted and furthermore in six ANM showing severe dysplasia with enhance expression of CK 8/18, CK 19, and MMP 9 in the apparently normal oral mucosa can suggest a field cancerization. Background: This study was carried out to assess the innervation patterns in oral cancer using the general neuronal marker protein gene product 9.5 (PGP 9.5) and to find an explanation for why oral cancer tends to be painless in the early stages. Materials and Methods: Tumor tissue from 30 unselected patients with oral squamous cell carcinoma was evaluated for this study. PGP 9.5 was used to localize nerve fibers in oral squamous cell carcinoma. 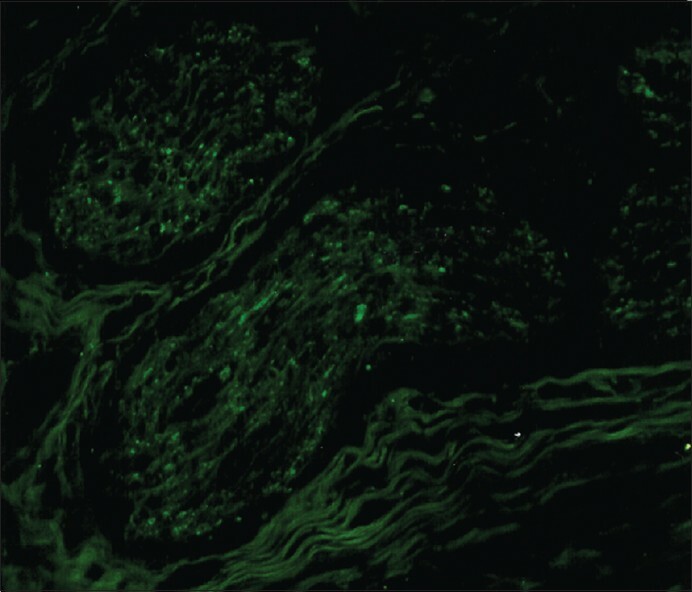 An indirect immunofluorescence technique using biotin/FITC streptavidin detection system was used on paraffin wax sections of tumor tissue fixed in neutral buffered formalin. Results: There was no PGP9.5 immunoreactivity in the normal tissue adjacent to the tumor in 18 cases out of 30 (60%). In 12/30 of oral squamous cell carcinoma, preexisting nerve fibers were detected in tissue stroma adjacent to the cancer tissue. Labeled nerve fibers between tumor cells were detected only in 2 out of the 30 cases. Conclusion: There are no apparent patterns of innervations in the cancer tissues themselves, but there are innervations patterns in the surrounding tissue, which presumably represents preexisting nerves. These results may partly explain why oral cancer tends to be painless in the early stages. Context: Significant increase in vascularity occurs during the transition from normal oral mucosa, through differing degrees of dysplasia, to invasive squamous cell carcinoma (SCC). Aims: To evaluate microvessel density (MVD) and vascular endothelial growth factor (VEGF) expression in oral tumorigenesis and correlate it with the clinicopathological characteristics. Settings and Design: VEGF expression and MVD were quantified immunohistochemically using anti-VEGF and anti-CD34 antibody. Materials and Methods: For this study we used a total of 60 archival specimens, including 10 normal oral mucosa (NOM), 7 mild epithelial dysplasia (Mild ED), 8 moderate epithelial dysplasia (Mod ED), 5 severe epithelial dysplasia (SED), 14 well-differentiated SCC, 11 moderately-differentiated SCC, and 5 poorly-differentiated SCC. 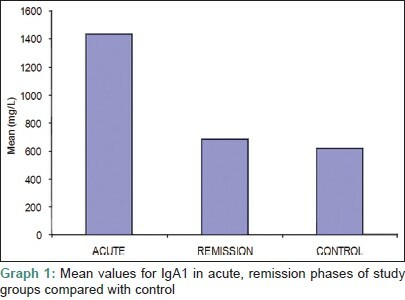 VEGF expression was assessed in relation to the localization, intensity, and area of the immunohistochemically stained cells. MVD was evaluated using the Image-Pro® Plus software. Statistical Analysis: One-way ANOVA (F test) was carried out for comparing the parameters for multiple groups such as different histopathological grades of dysplasia and carcinoma. Comparison between groups was carried out using the Student's 't' test. Correlations between VEGF score and MVD were estimated using the Karl Pearson coefficient of correlation. Results: VEGF and MVD appeared to increase with disease progression and were statistically higher in oral SCC than in epithelial dysplasia and normal buccal mucosa. There was significant correlation between VEGF expression and MVD. Conclusions: These findings indicate that VEGF expression is upregulated during head and neck tumorigenesis. Background : Reports of series of central jaw tumours in children are rare hence predicting their biological behaviour as well as treatment, prognosis have not been documented from this part of the world. Aim : To study retrospectively, the paediatric central jaw tumours, reported to our institute with relation to site of occurrence, presentation and biological behaviour. Materials and Methods : All consecutive patients (<18 years), between 2004-2010, histologically diagnosed as having an intraosseous tumour or tumour-like lesions formed the study population. Patients fulfilling the inclusion criteria were only considered for further study. The entire study material was analyzed and grouped into various categories for logical conclusions. The data accumulated were grouped, entered and analyzed. Results : Sixty-one cases fulfilled the criteria. Gender distribution was equal, with mandible predominance (2.2:1) and a predominance of non-odontogenic lesions (2:1). There were 4 malignant and 57 benign conditions. Anterior jaw lesions were 23 while 38 were present in the posterior region of jaws (1:1:6). 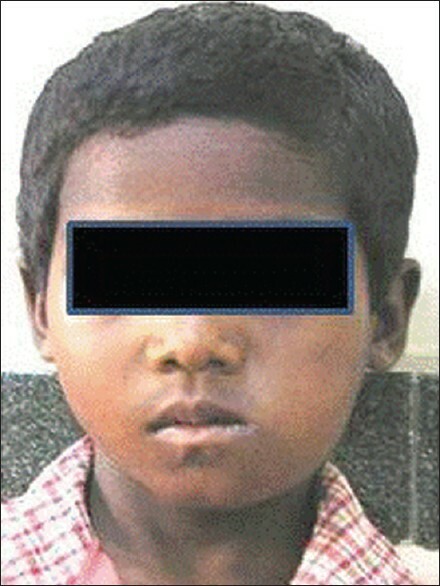 Conclusions : The pattern of central jaw tumours presentation in children from this part of India has been documented. In this study, paediatric jaw tumours are less common compared to those in adults with non-odontogenic tumours being common. The finding of the present study indicates that an impacted tooth, beyond the eruption time deserves more attention for the reason of associated pathologies in children. Background: Radiation given during treatment of oral and pharyngeal malignancy frequently causes alteration of the oral environment predisposing to the colonization of the oral mucosa by yeast species most frequently Candida. Objective: Thus, this study was undertaken in 107 patients to find out association between radiation therapy and frequency of oropharyngeal candidosis, to quantitate colony forming units (CFUs) to identify Candida at species level and to check the incidence of serotype A and B in C. albicans. Materials and Methods: The study was done on patients suffering from oropharyngeal cancer who were advised radiotherapy. The oral rinse collection method was used to collect the sample. 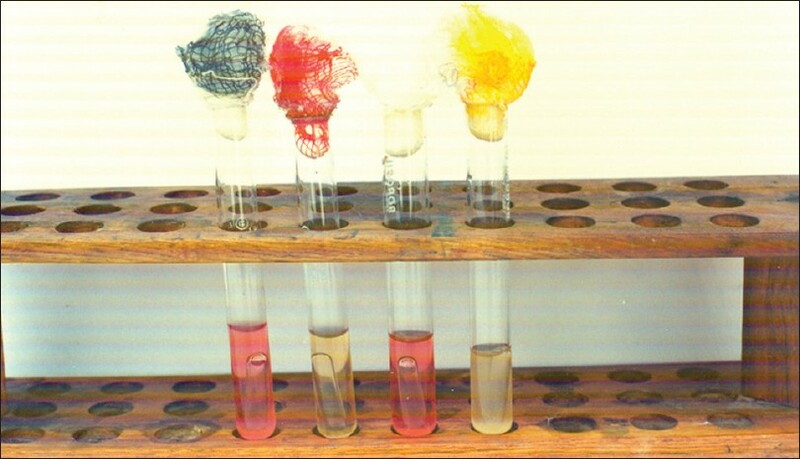 Sabourauds Dextrose Agar (SDA) was used as primary culture media and subsequently speciation was done using standard techniques. The strains of C. albicans were serotyped employing the method described by Hansclever and Mitchell (1961, J Bacteriol 1961;82:570-3). Results: 26.16% patients were mycologically positive for candida before radiotherapy with CFUs 100. 14 ± 59.11 that increased to 60.74% patients during radiotherapy with an increase in CFUs to 490.15 ± 207.97. Clinically, grading of mucositis was done and also individual signs and symptoms were noted in each patient. The occurrence of erythmatous lesions, ulceration, and xerostomia were found to be statistically significant (P<0.05). C. albicans was the most frequently encountered species with higher prevalence of serotype A suggesting higher virulent species. Conclusion: It is proposed that in such patients taking radiotherapy prophylactic antifungal treatment should be given specially in patients showing development of oral mucosal lesions such as erythmatous lesions, ulcerations, and complaining about dryness of mouth, that is, xerostomia irrespective of presence or absence of clinical oral candidosis. Aims and Objectives: To know the prevalence of Candidal colonization, and to isolate and know the Candidal species prevalent in the oral cavity from the oral rinse samples collected from the individuals attending to the Voluntary Counseling and Confidential Testing Center (VCCTC) and the antiretro-viral therapy (ART) Center at Government General Hospital, Guntur, Andhra Pradesh, South India. Materials and Methods: The study group consisted of 50 HIV negative asymptomatic individuals (Group I); 50 HIV positive individuals (people living with HIV AIDS [PLWHA's]), who are naïve to antiretro-viral therapy (direct walk-in clients of VCCTC) (Group II); and 50 HIV positive individuals with CD4+ count less than 250 and who are started on highly active anti retroviral therapy (HAART) (Group III). Routine mycological tests for the isolation of pure cultures of Candida and also the speciation procedures were done. Results: In the study group, 53 (Group I=11; Group II=23; Group III=19) were culture positive. The prevalence of Candida was comparatively high in the age range between 41-50 years in Group II; 51-60 years, in Group III. A male predominance was observed in the Group I (M:F=16:6) and Group III (M:F=20:18), with a slight female predominance in the Group II (F:M=24:22). The overall culture positivity was 35.3%. Candida albicans was the highest prevalent species (47.17% of the isolates). A comparison of the culture positivity with the CD 4 counts of the study subjects was statistically highly significant. A pair wise comparison of the culture positivity with that of the colony forming units/mL from the subjects showed a high significance between Group I and Group II, and between Group I and Group III. Conclusion: Candidal infections in immuno compromised patients are often severe, rapidly progressive, and difficult to treat and such patients have a definitive risk of developing oral candidiasis wherein, even the members of the normal oral flora may become pathogenic. Candida albicans is the common isolate. Nonalbicans species are also emerging as opportunistic pathogens. In view of this changing pattern, it is strongly recommended that species identification can help in much better treatment strategies, and thus, gain a good control over the disease. The findings of this study would be helpful in any further studies which, if done prospectively on a larger cohort, can be confirmatory. Background: The etiology of oral lichen planus (OLP) is not fully understood. It is generally considered to be a T-cell mediated chronic inflammatory oral mucosal disease. There is increasing evidence that chronic inflammation is linked to the diseases associated with endothelial dysfunction and is involved in the induction of aberrant angiogenesis. Aim: Our aim was to evaluate the role of angiogenesis in the pathogenesis of OLP by immunohistochemistry, using the CD34 antibody. 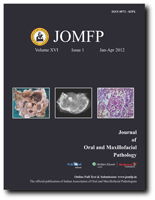 Materials and Methods: Forty tissue sections (7 of erosive lichen planus, 18 of reticular oral lichen planus, and 15 of normal oral mucosa), were assessed for microvessel density (MVD) in five selected areas of high inflammatory infiltrate by immunohistochemistry for the expression of CD34 antibody. Results and Conclusion: The mean MVD was 44.47 in the control group (normal oral mucosa) and 97.24 in the OLP group, showing that there is increased angiogenesis in the latter. Reticular OLP had mean MVD of 84.61 and erosive OLP had mean MVD of 129.71, showing relatively greater angiogenesis in erosive OLP as compared to reticular OLP. Thus, angiogenesis can be considered to play a role in both the etiopathogenesis and the progression of OLP. Context: Clinical evaluation of gingivitis and/or periodontitis does not predict the progression or remission of the disease. Due to this diagnostic constraint, clinicians assume that the pathology has an increased risk of progression and plan treatments, despite the knowledge that all inflamed sites are not necessarily progressing. Extensive research has been carried out on gingival crevicular fluid (GCF) components that might serve as potential diagnostic markers for periodontitis. Among them alkaline phosphatase (ALP) levels in GCF has shown promise as a diagnostic marker. Aim: This study compares the levels of GCF alkaline phosphatase in patients with chronic periodontitis before and after scaling and root planing. Materials and Methods: This study is an in vivo longitudinal study conducted on twenty patients with localized periodontitis. The GCF was collected from the affected site prior to scaling and root planing and ALP level estimated. The probing depth and plaque index at the site were also measured for correlation. Patients were recalled after 7, 30, and 60 days for reassessment. Results: The GCF ALP values showed a sustained, statistically significant decrease after treatment. There was a positive correlation with probing depth but not with plaque index measured at each interval. Conclusion: The assessment of level of periodontal disease and effect of mechanical plaque control on the progression and regression of the disease can be evaluated precisely by the corresponding GCF ALP levels. Thus, alkaline phosphatase level is not only a biomarker for the pathology but also an indicator of prognosis of periodontitis. Cells with unique capacity for self-renewal and potency are called stem cells. With appropriate biochemical signals stem cells can be transformed into desirable cells. The idea behind this article is to shortly review the obtained literature on stem cell with respect to their properties, types and advantages of dental stem cells. Emphasis has been given to the possibilities of stem cell therapy in the oral and maxillofacial region including regeneration of tooth and craniofacial defects. Cleft lip and palate (CLP) are birth defects that affect the upper lip and the roof of the mouth. CLP has a multifactorial etiology, comprising both genetic and environmental factors. In this review we discuss the recent data on the etiology of cleft lip and palate. We conducted a search of the MEDLINE database (Entrez PubMed) from January 1986 to December 2010 using the key words: 'cleft lip,' 'cleft palate,' 'etiology,' and 'genetics.' The etiology of CLP seems complex, with genetics playing a major role. Several genes causing syndromic CLP have been discovered. Three of them-T-box transcription factor-22 (TBX22), poliovirus receptor-like-1 (PVRL1), and interferon regulatory factor-6 (IRF6)-are responsible for causing X-linked cleft palate, cleft lip/palate-ectodermal dysplasia syndrome, and Van der Woude and popliteal pterygium syndromes, respectively; they are also implicated in nonsyndromic CLP. The nature and functions of these genes vary widely, illustrating the high vulnerability within the craniofacial developmental pathways. The etiological complexity of nonsyndromic cleft lip and palate is also exemplified by the large number of candidate genes and loci. To conclude, although the etiology of nonsyndromic CLP is still largely unknown, mutations in candidate genes have been identified in a small proportion of cases. Determining the relative risk of CLP on the basis of genetic background and environmental influence (including smoking, alcohol use, and dietary factors) will be useful for genetic counseling and the development of future preventive measures. Septins belong to the GTPase superclass of conserved proteins and have been identified to play a role in diverse aspects of cell biology, from cytokinesis to the maintenance of cellular morphology. At least 14 septins have been identified in humans. With their complex patterns in gene expressions and interaction, it has been reported that alterations in septin expression are observed in human diseases. Although much is not known about the role of human septins in oral carcinogenesis, circumstantial evidence does indicate that it may play a major role. This review intends to summarize the basis of septin biology, with the focus being on the evidence for septin involvement in human oral cancer. 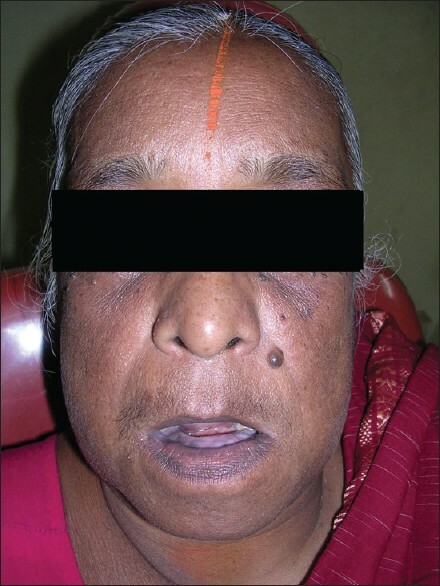 Pyogenic granuloma or granuloma pyogenicum is a well-known oral lesion. The name pyogenic granuloma is a misnomer since the condition is not associated with pus and does not represent a granuloma histologically. Pyogenic granuloma of the oral cavity is known to involve the gingiva commonly. Extragingivally, it can occur on the lips, tongue, buccal mucosa, palate, and the like. A history of trauma is common in such sites. The etiology of the lesion is not known, though it was originally believed to be a botryomycotic infection. It is theorized that pyogenic granuloma possibly originates as a response of tissues to minor trauma and/or chronic irritation, thus opening a pathway for invasion of nonspecific microorganisms, although microorganisms are seldom demonstrated within the lesion. Pathogenesis of pyogenic granuloma is still debatable. Medline and PubMed databases were searched under the following key terms: Pathogenesis of oral pyogenic granuloma, pyogenic granuloma, and oral pyogenic granuloma. This search was limited to articles on human/animal studies which were published in English language. After reviewing the searched articles, the relevant articles were selected for the present review. Through this article, we have tried to summarize and present all the concepts of pathogenesis related to this most common and most mysterious oral lesion. 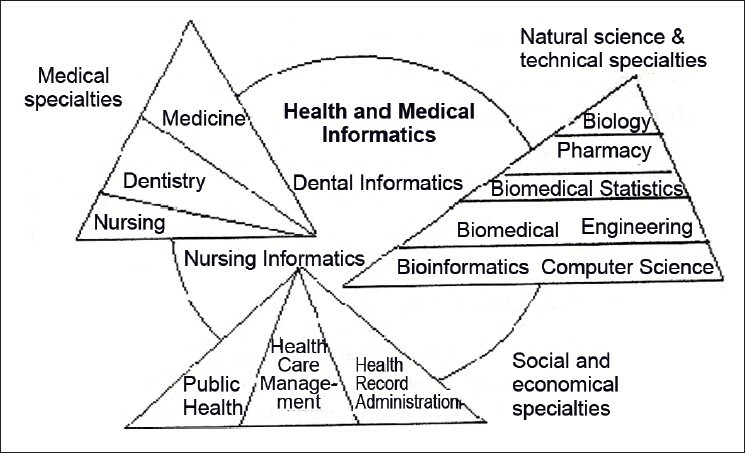 Bioinformatics is a relatively new field of science that incorporates the principles of biology and computer science. It is mainly concerned with collecting, storing, and retrieving data from large databases. Ever since the successful completion of the Human Genome Project, there has been an exponential growth in the volumes of biological data that is being generated worldwide. The evolution of bioinformatics has made it possible to access these databases and apply the information for better research. One discipline that has been benefitted from the advent of bioinformatics is oral pathology. Oral pathology is a branch of dentistry which deals with the diseases of the head and neck region. Remarkable progress has been made in the diagnosis and treatment of diseases with the aid of bioinformatics. This article attempts to review the evolution and progress of dental informatics as a specialty and its applications in oral pathology. Melanomas are neoplasms of melanocytic origin. They are aggressive neoplasms with an unpredictable behavior, and can involve virtually any organ of the body. Oral melanomas are very rare and have an extremely poor prognosis. Early diagnosis and prompt treatment is the key to reduce the morbidity and mortality. A second primary tumor is a new primary tumor developing in a person with a history of tumor, in a new site or tissue and subsequent to the initial tumor. Patients with previous history of melanoma are associated with a higher risk of developing second primaries. A case of second primary oral melanoma in a 55-year-old female is reported here. The anachronistic presentation of the primary and the second primary lesions make this case clinically interesting. 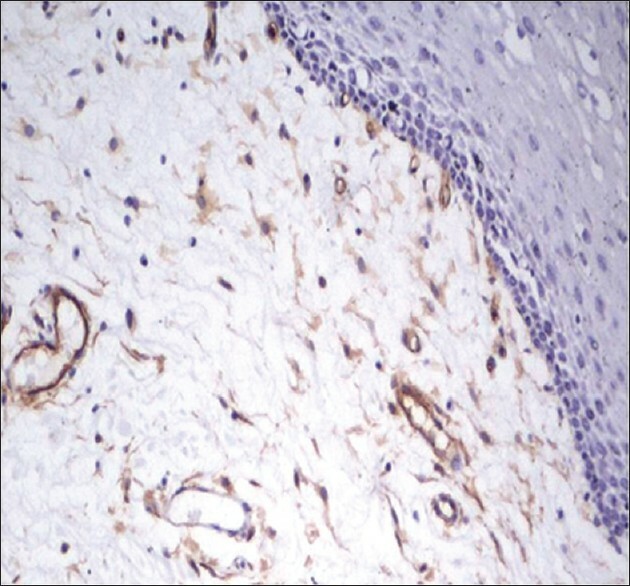 Noteworthy immunohistochemical findings were recorded, HMB-45 positive and S-100 negative. Schwannoma is a benign, encapsulated, perineural tumor that arises from the Schwann cells. Approximately 25% of the reported cases originate from the head and neck region. Of these, approximately 1-12% occurs intraorally. The intrabony lesion accounts for less than 1% of the central neoplasms. We report a rare case of intraosseous schwannoma in an 8-year-old male patient characteristically originating from the mental nerve. Radiographic examination followed by histopathological evaluation was further confirmed by immunohistochemical markers, S-100 protein, and GFAP that stained intensely positive for the tumor. Thus, confirming the diagnosis of intraosseous schwannoma. 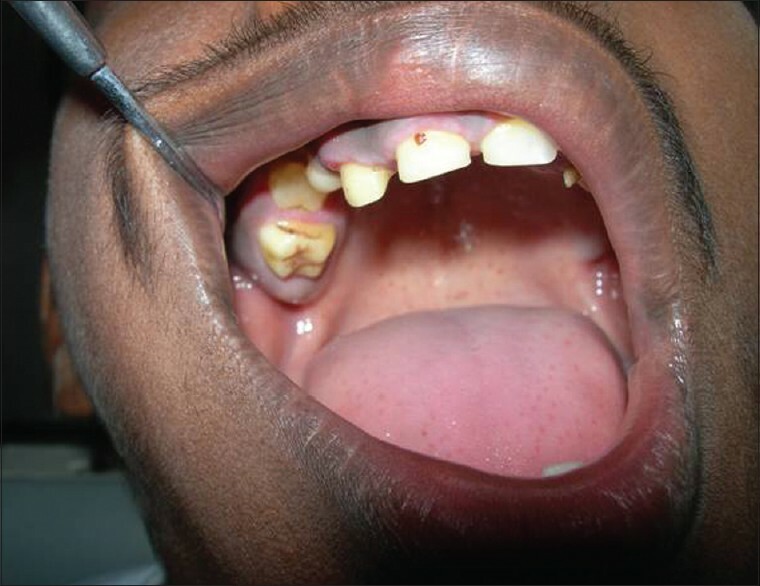 Diagnosis of palatal swellings is a challenge. Benign and malignant tumors may be misinterpreted as lesions of inflammatory origin. We present a case of B-cell non-Hodgkin lymphoma on the palate of a 40-year-old male. A number of factors can make the diagnosis of oral lymphoma difficult. Many lymphomas are extranodal, there is usually a prominent superimposed nonspecific inflammatory response and thus they mimic benign lymphoid hyperplasia. It is important for the pathologist to be familiar with features that distinguish benign from malignant lymphoid proliferations. Angiolipoma is a variant of lipoma with a prominent vascular component. It is the most common tumor of the forearm followed by trunk and extremities of young individuals. It's occurrence in head and neck region is rare. 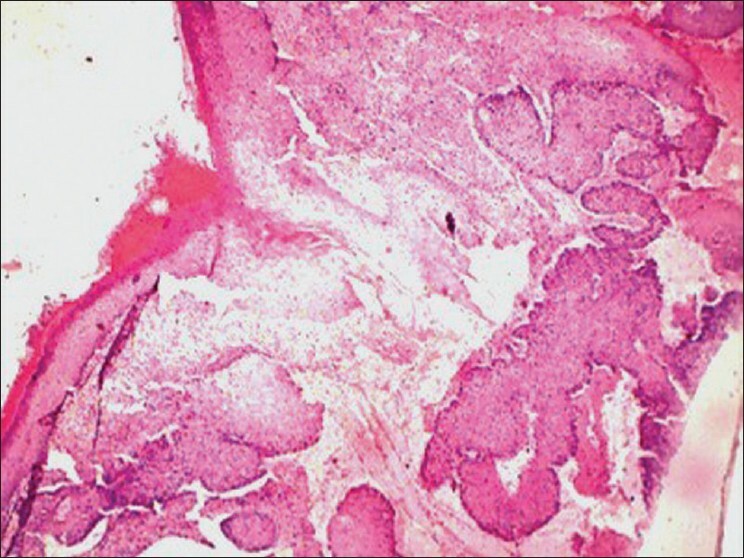 In this report, we present clinical and histopathologic features of non-infiltrating angiolipoma occurring on the upper lip in a 9-year-old female. Toluidine blue stain is used to demonstrate increased mast cell density around blood vessels, speculating its role in vasculogenesis. Paget's disease (PD) is a chronic progressive disease of the bone characterized by abnormal bone resorption and deposition affecting either single bone (monostotic) or many bones (polyostotic) with uncertain etiology. We report a case of isolated mandibular involvement in a 65-year-old female patient, clinically asymptomatic with abnormally increased alkaline phosphatase level (1 368.1 U/l). Although prevalence of PD is common in western countries, but rare in Asian chapter, that too isolated mandibular involvement, considering this fact, we report this case of PD for documentation. 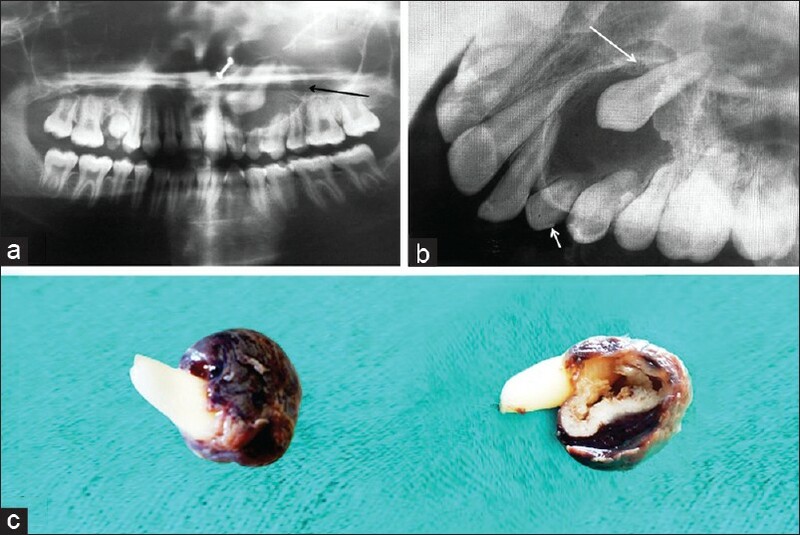 The calcifying epithelial odontogenic tumor is a rare benign odontogenic tumor that was first described by Pindborg in 1955. It accounts for less than 1% of all odontogenic neoplasms. The tumor is characterized histologically by the presence of polygonal epithelial cells, calcification, and eosinophilic deposits resembling amyloid. Noncalcifying Pindborg tumor is very rare and only three cases have been documented in the English language literature so far. We present an additional case of noncalcifying Pindborg tumor and review the previously reported cases. Because noncalcifying Pindborg tumor is believed to be an aggressive variant, a definitive resection of the tumor with tumor-free surgical margins and long-term follow-up is recommended. The squamous odontogenic tumor (SOT) is a rare, benign, locally infiltrative neoplasm of the jaws that appears to originate from the rests of Malassez, gingival surface epithelium or from remnants of the dental lamina. SOT was first described by Pullon et al. (1975). Since then there has been paucity in the number of reported cases, especially in the Indian subcontinent. The tumor is often asymptomatic, although it can present with symptoms of pain and tooth mobility. 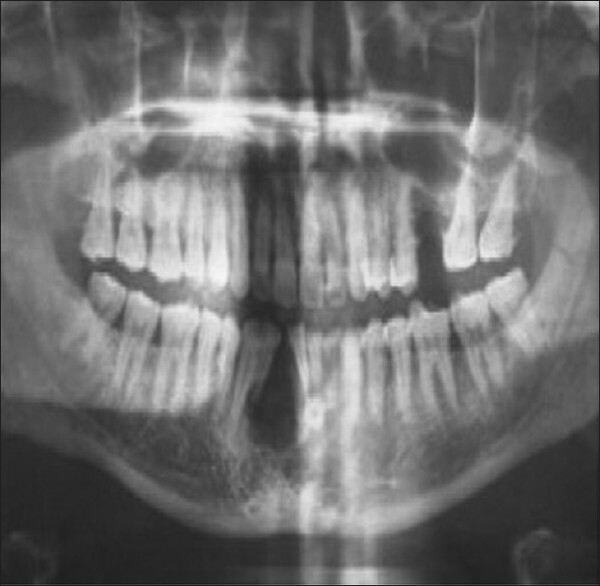 The characteristic radiographic appearance is that of a triangular-shaped unilocular radiolucency associated with the roots of erupted, vital teeth and has a predilection for the anterior maxilla and the posterior mandible. Histologically, the tumor is characterized by the formation of variably sized nests and cords of uniform, benign-appearing, squamous epithelium with occasional vacuolization and keratinization. 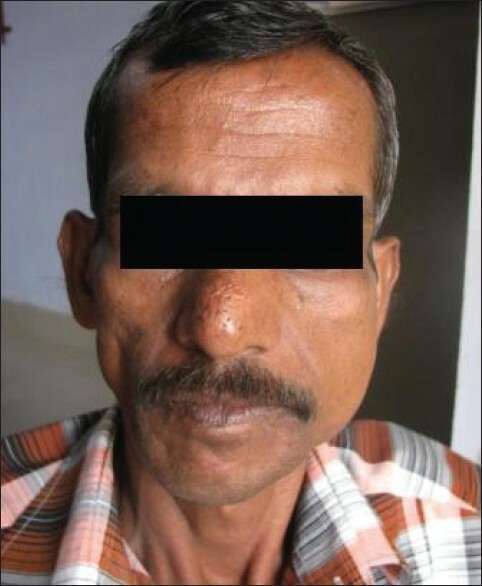 We report a case of SOT occurring in a 58-year-old male in the anterior mandible with unusual localization and appearance. Odontogenic tumors are a group of heterogeneous lesions, features of which have been catalogued for several decades. Adenomatoid odontogenic tumor (AOT) is a relatively rare and distinct odontogenic tumor that is exclusively odontogenic epithelium in origin. 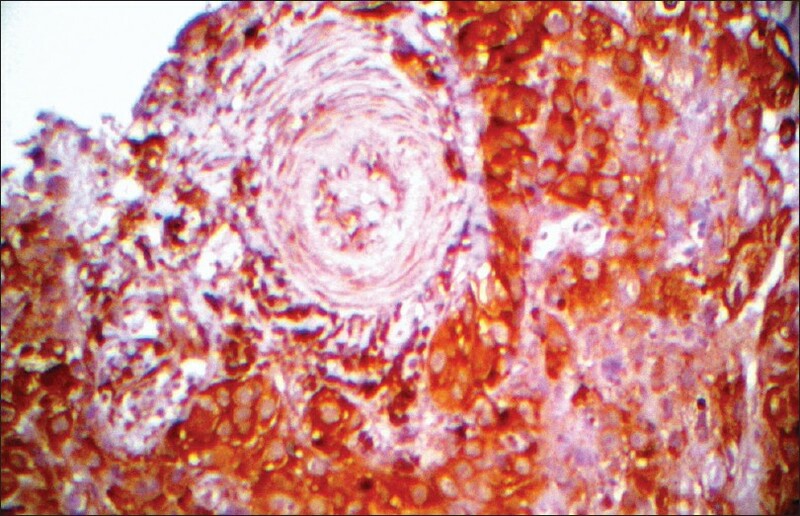 Although considerable number of reports is available with regard to the clinical and histological spectrum of AOT, very few have highlighted its varied histological presentations. Therefore, this article focuses on the assorted histoarchitectural patterns of AOT. Ameloblastoma is a slow growing odontogenic epithelial tumor of jaw. It accounts for 1% of all tumors and cysts arising in maxilla and mandible. Although it is locally invasive and has a marked tendency to recur, metastasis is rare. Of the various histological patterns of ameloblastoma, the granular cell type is extremely rare accounting for 4% of ameloblastomas. We report a case of granular cell ameloblastoma with metastasis to the cervical lymph node presenting in a 40-year-old Indian female. Multiple impacted permanent teeth are usually related to syndromes, metabolic and hormonal disorders. However, in some cases, impaction of multiple teeth is not associated with any syndrome. 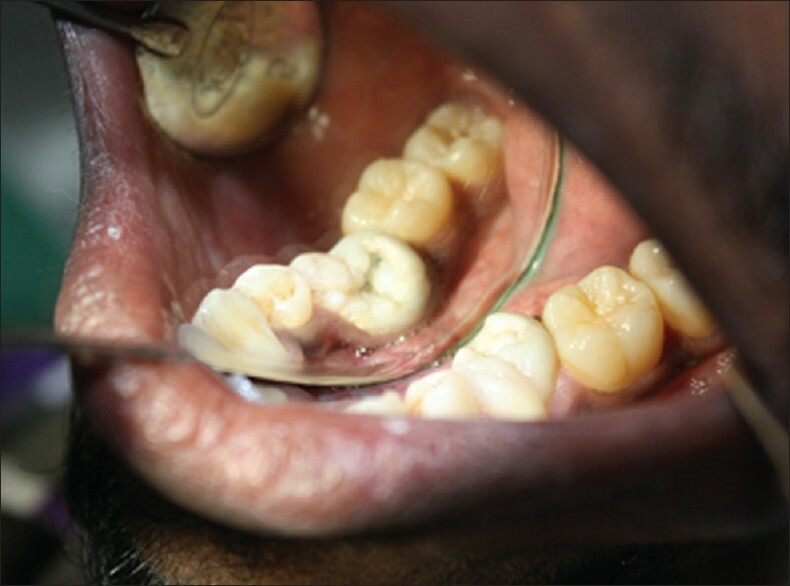 In this report, we present a case of 17-year-old male patient with missing teeth. Radiographs revealed multiple impacted permanent teeth, though medical and family history along with physical examination was not suggestive of any syndromes. 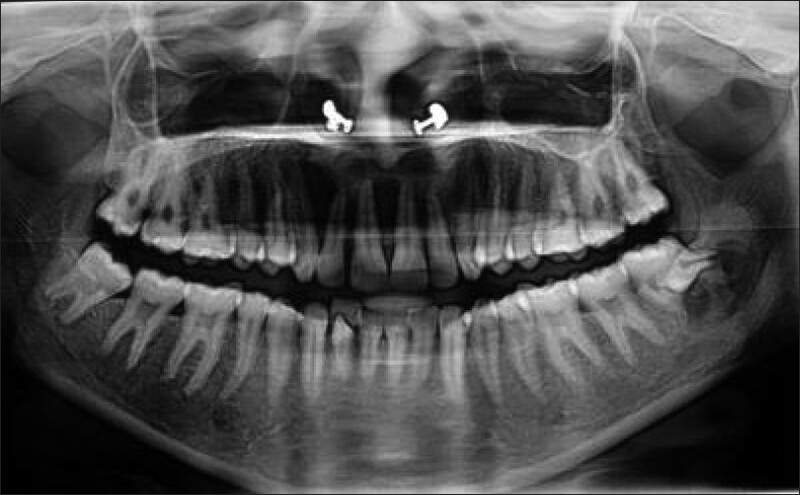 If other investigations are negative, an idiopathic case of multiple impacted teeth is suggested to be the possible diagnosis. The objective of this report is to increase awareness of such cases especially in the absence of hereditary/genetic/metabolic factors usually inherent in such scenarios. The patient management in such cases needs to be planned specifically from a multidisciplinary standpoint. Fusion is the union of two normally separated tooth germs resulting in the formation of a single large tooth. The prevalence of this anomaly is less than 1% and most common in the primary dentition, in the incisor-canine region. Fusions are almost always unilateral, but few cases of bilateral fusions have been reported. The purpose of this article is to report a rare case of bilateral fusion of mandibular second premolar with supernumerary tooth. Fusion is the union of two tooth buds that are normally separated. Fusion is more frequent in deciduous teeth, particularly in the anterior region. The etiology of fusion is not known. It has been suggested that the pressure of adjacent dental follicles produces their contact and fusion before calcification. There is no difference between men and women in incidence. The term paradental cyst means that such type of cysts that are close proximity with the root of a tooth. A history of recurrent pericoronitis is reported usually and there is often the presence of a communication between the periodontal pocket and the cyst. We present a rare case report where in partially erupted mandibular third molar is fused horizontally with a supernumerary tooth with paradental cyst. Salivary duct carcinoma of the parotid gland is an uncommon tumor, highly aggressive. About 200 cases have been reported in the English literature. 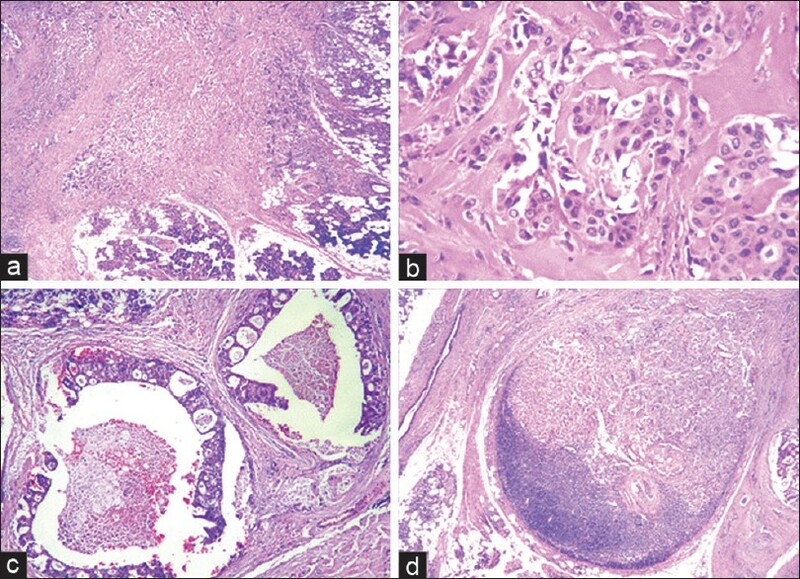 Pathomorphologically, these tumors showed great similarities to ductal carcinoma of the female breast, which is why they described this tumor as "salivary duct carcinoma." The authors describe a new case of salivary duct carcinoma of the parotid gland. We present the case of a 50-year-old patient with progressive facial paralysis. The MRI examination of the head showed two ill-defined formations. 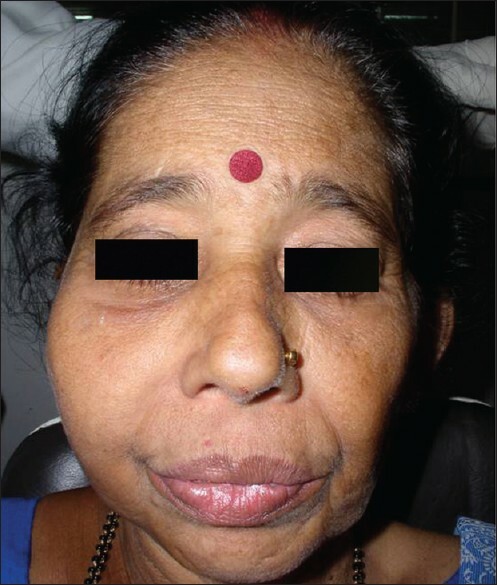 A malignant tumor was strongly suspected, so that a total left parotidectomy with excision of the adjacent facial nerve and left lymph node dissection was performed. Microscopic examination concluded to a salivary duct carcinoma of the left parotid gland negative with Her2/neu antibody with lymph node metastasis. There were no recurrences or metastases within 3 years of follow-up. Salivary duct carcinoma of the parotid gland is a rare tumor with an aggressive behavior. This is due to its propensity to infiltrate distant organs. The diagnosis is based on microscopic examination. Treatment modalities are non-consensual, but some authors advocate the necessity of aggressive approach, especially in tumors negative with Heur2/neu antibody. This is due to the fact that the overexpression of this antigen was reported to be associated with a poor prognosis. Malignant tumors of the paranasal sinus are uncommon, constituting less than 1% of all malignancies and 3% of all head and neck cancers. Nonsquamous cancers of the maxillary sinus are even rarer as is evident from the limited data available on the clinical characteristics and outcomes. 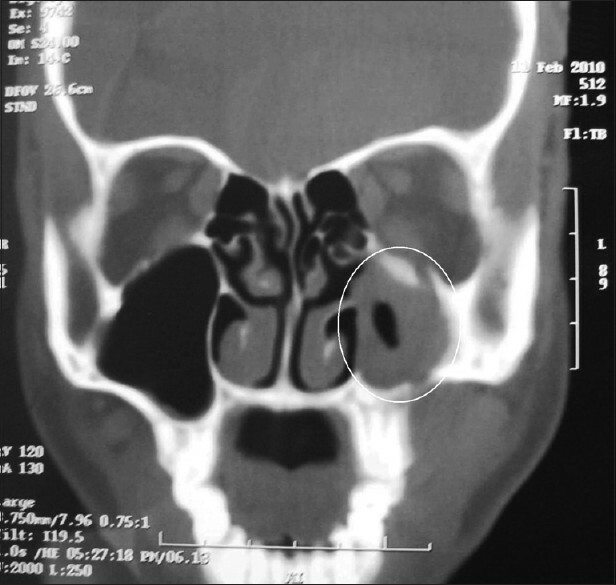 Mucoepidermoid carcinoma accounts for 13% of all malignancies occurring in maxillary sinus. 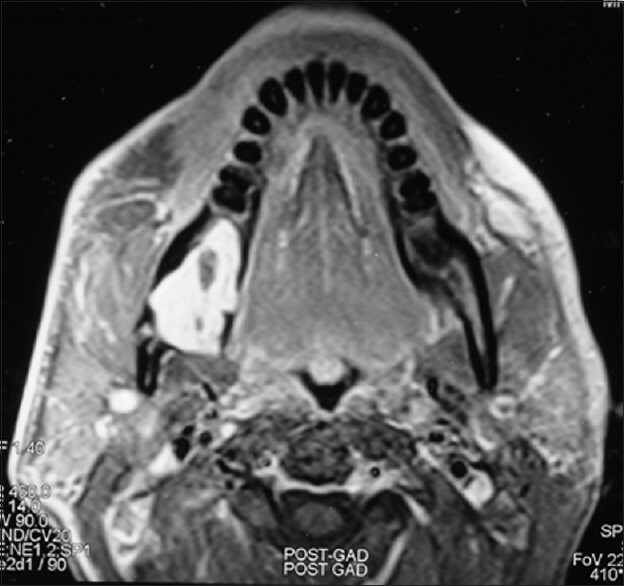 We report a rare case of high-grade mucoepidermoid carcinoma of maxillary sinus in a 45-year-old female along with review of the literature. 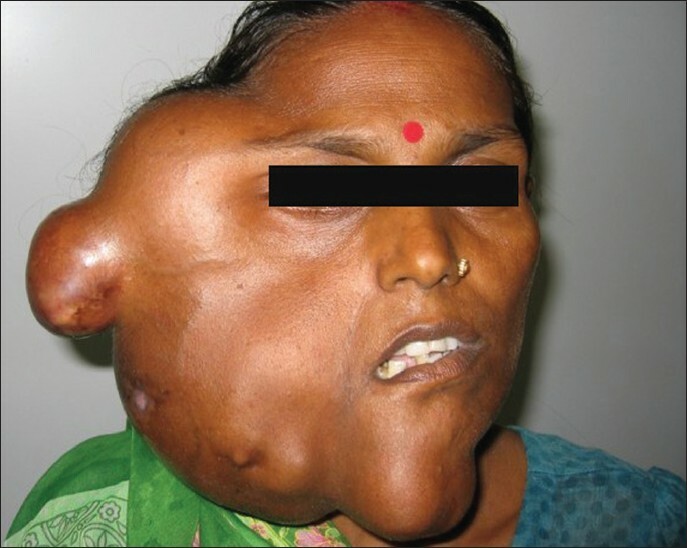 Intraosseous mucoepidermoid carcinoma of jaw bones is a rare lesion. 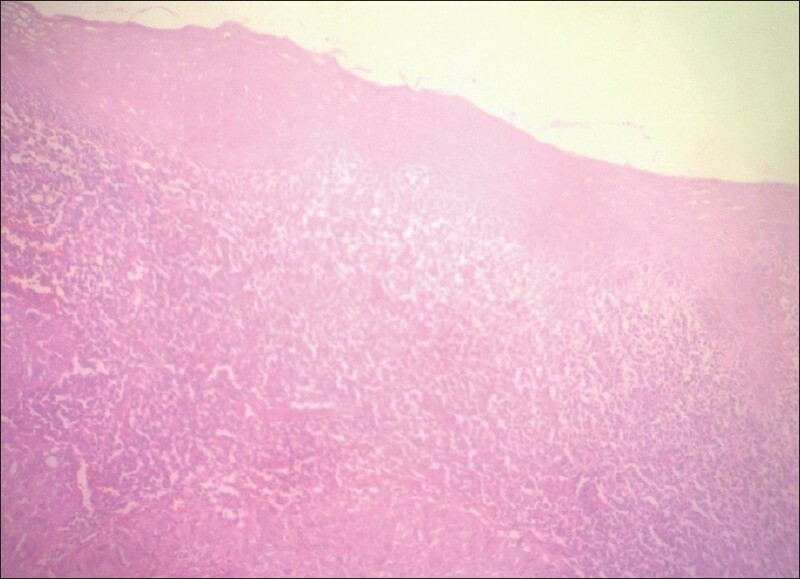 Abundance of clear cells in an intraosseous mucoepidermoid carcinoma may complicate its histopathologic diagnosis. It becomes extremely important to distinguish this lesion from other clear cell lesions of jaw region. Here, we report a case of clear cell variant of intraosseous mucoepidermoid carcinoma in the mandible. 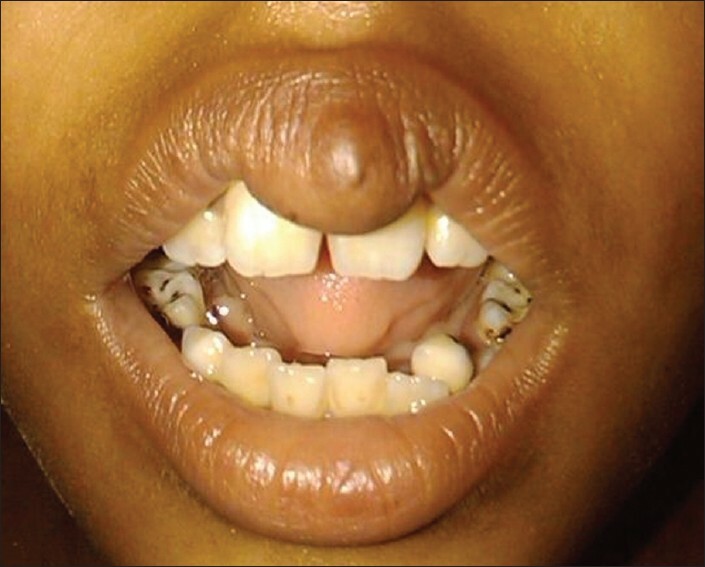 Oral erythema multiforme (EM) is considered as a third category of EM other than EM minor and major. Patients present with oral and lip ulcerations typical of EM but without any skin target lesions. It has been reported that primary attacks of oral EM is confined to the oral mucosa but the subsequent attacks can produce more severe forms of EM involving the skin. Hence, it is important to identify and distinguish them from other ulcerative disorders involving oral cavity for early management. 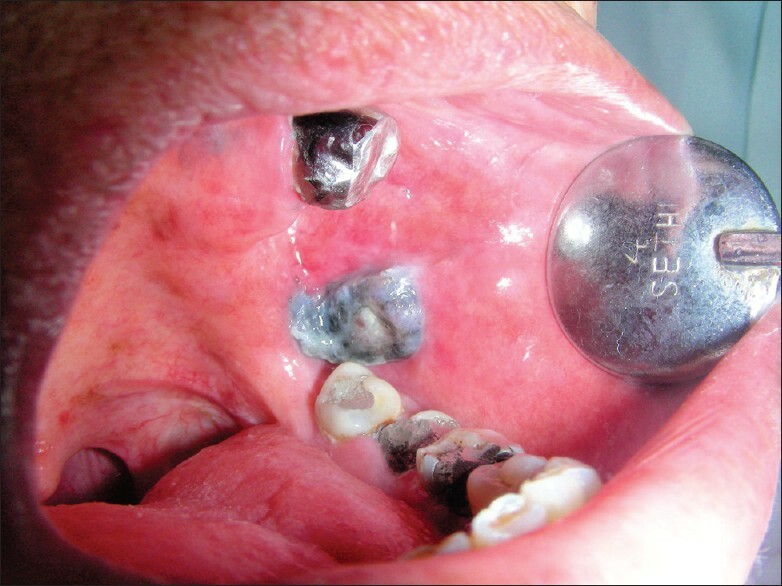 This article reports two cases of oral EM that presented with oral and lip ulcerations typical of EM without any skin lesions and highlights the importance of early diagnosis and proper management. Fungal infection of the paranasal sinuses is an increasingly recognized entity, both in normal and immunocompromised individuals. The recent increase in mycotic nasal and paranasal infections is due to both improved diagnostic research and an increase in the conditions that favor fungal infection. Although fungal infections of the paranasal sinus are uncommon, 3-5% of incidence is reported. Aspergillus, Candida, and Mucor species are the most common causative agents of fungal sinusitis, but infection with lesser known species have been reported across the world infrequently. This article reviews and presents a case report of chronic fungal sinusitis in an immunocompetent adult male infected with two species of Hyalohyphomycosis group namely, Paecilomyces and Scopulariopsis which are opportunistic soil saprophytes, uncommon to humans.